Although I tend to prefer Indian food over Chinese food, I really enjoy katsu curry sauce on occasion. The only problem is that katsu curry sauce tends to traditionally be very heavily weighted with onion and garlic, a big no-no for those who follow the low FODMAP diet. However, there are tricks which can be utilised when it comes to using onion and garlic in low FODMAP cooking, the biggest one being that you can infuse the flavours of onion and garlic into oil without them leaching FODMAPs into the oil itself. So, as long as you remove the onion and garlic from the oil in question it won’t affect your tummy. 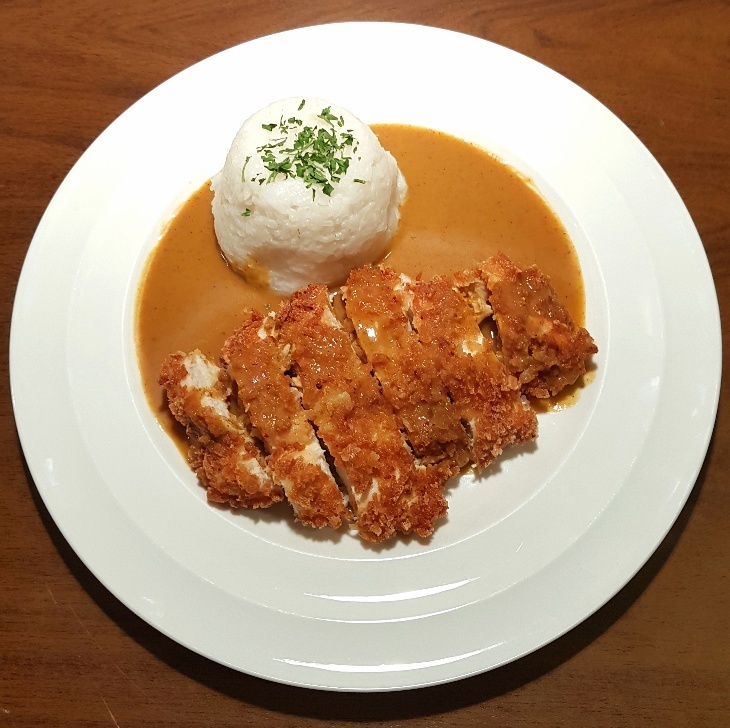 With this in mind, I decided to have a bash at making a chicken katsu curry at home and was absolutely thrilled with the results! This recipe genuinely tastes like a ‘proper’ Chinese katsu curry sauce. I made mine to accompany chicken breasts which I had coated in gluten-free breadcrumbs and served it alongside sticky rice and it tasted like a real takeaway meal from a Chinese restaurant. I flavoured my curry sauce with garam masala, but Casa de Sante sells a pre-made Indian Curry Seasoning Mix which is really tasty. You can buy it by clicking here. I think there can be a tendency to shy away from using onion and garlic when you follow the low FODMAP diet because, and I speak from experience here, they can cause us so much pain it doesn’t seem worth the hassle to try to incorporate them into our diets no matter how beneficial they can be to our cooking. However, I would urge you to try this recipe because, apart from the fact that it’s delicious, it won’t cause you discomfort either. 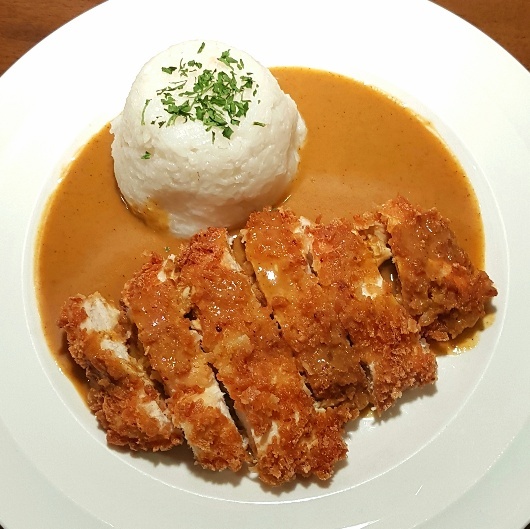 This recipe for chicken katsu curry uses tender, juicy chicken breasts that have been coated in breadcrumbs and fried until crispy, which lie on a bed of fluffy soft rice and is topped with a flavoursome, thick katsu curry sauce. Have some prawn crackers at hand and you’ll feel as though you’ve treated yourself to a great quality takeaway! To make the breaded chicken: Put the flour, beaten egg and breadcrumbs out onto separate plates. Season the flour with salt and pepper. Take one chicken breast at a time and coat it in the flour, then the egg and then the breadcrumbs before placing the chicken to one side. Heat the oil in a large saucepan over a medium heat and once it’s hot add the onion and garlic. Fry until the onion is translucent and then remove all of the onion and garlic from the oil and add the carrots. Cook the carrots in the oil until they are soft. Stir in the flour, sugar and curry powder and then add the stock a little at a time, stirring all the while, until a sauce is formed. Add the soy sauce and simmer the sauce for 15-20 mins to let the flavours develop. While the sauce is simmering start boiling your rice and cook your chicken breasts by heating the vegetable oil in a frying pan over a medium heat and frying the chicken until it is cooked and no longer pink in the middle. Carefully use a stick blender or Nutribullet to blend the sauce until it is smooth and then serve the chicken on a bed of rice with plenty of the sauce poured on top.